Far too frequently, train crashes still take place in the United States. While trains are a smart way to move goods, trains are too often involved in collisions that injure passengers, railway personnel, and the general public. In fact, a derailment can pose a serious risk to an entire community if toxic chemicals are involved. If you are injured in a train crash or a derailment in southern California, speak immediately to an experienced Riverside train accident lawyer Chris Purcell. Chris has been successfully advocating on behalf of injury victims for over twenty years. He can look at the details of your case and provide the candid legal advice that injury victims need. If you choose to file a personal injury claim after a train crash or derailment, lawyer Chris Purcell will work tirelessly for the compensation you need for your medical expenses. 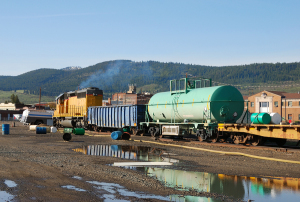 Every year in the U.S. about 3,000 train accidents happen, and on average, a derailment involving a chemical spill and forcing an evacuation happens twenty or twenty-five times a year. Train accidents are almost always caused by human error or negligence or by mechanical failures or defects. Obviously, train crashes can also happen when tracks are blocked by animals, people, trees, boulders, or vehicles. When negligence is behind a train wreck, and you’re injured because of that negligence, you can be compensated for your medical care and other injury-related damages, but you’ll need a committed, experienced lawyer fighting for your rights. You’ll need Chris Purcell. Being in a train accident can be shocking. It may take you a few moments to process what has happened, but once you do, it’s important that you know exactly what to do to help your personal injury claim. Your first priority should be receiving immediate medical attention for any injuries have sustained. If you do receive treatment, keep all documentation related to your injuries and be sure to follow the doctor’s orders closely. Prescribed medication should be filled and taken as soon as it is issued, and if necessary, you should return for a follow up visit with your doctor. If you do not follow the doctor’s orders, the liable party may be able to claim your injuries are not serious since you did not follow what you were told to do. While you are still at the scene of the accident, try to document as much evidence as possible. Try to remember exactly what happened leading up to the accident and jot it down somewhere in case you forget the details later on. Was anyone on the tracks at the time of the accidents? Was anything blocking the path of the train? Did you hear anything unusual? Were the brakes applied? These are all important questions to answer after a train accident. If possible, photograph any evidence that is at the scene, including your injures, the damage to the drain and the condition of the train tracks. After you have received medical attention and documented the accident, contact attorney Chris Purcell. Never speak with an insurance company—whether it is to tell your side of the story or to discuss a settlement—until you have met with an attorney to talk about your case. An insurance company may try to settle quickly with you so they can get you to sign an agreement before you realize the extent of your injuries. Don’t fall into this trap. Attorney Chris Purcell will be with you every step of the way during your fight to receive compensation for the injuries you sustained after a train accident. Contact Chris Purcell today to schedule a free legal consultation. Each train accident is unique, so determining who is liable will be done on a case-by-case basis. Chris Purcell will thoroughly review the details of your case to identify the liable parties. The owner of the train track may be liable for the accident if they failed to fulfill their legal duties to keep the tracks safe for visitors. Or, if the train collided with another vehicle who was for one reason or another on the tracks, that vehicle’s driver could be held liable. If the accident resulted after a part of the train’s equipment malfunctioned, the manufacturer of that specific part may be held liable, as long as the malfunction was not due to poor maintenance. The company that owns and operates the train may also be at fault. Companies that operate trains are in charge of keeping the train in good condition and ensuring that every employee is properly trained prior to beginning work. These companies also have to follow scheduling guidelines to make sure employees are not overworked and fatigued while operating the train. If the accident was a result of a poorly maintained train or an overworked or undertrained employee, the company that owns and operates the train may be held liable. Before you can identify who is liable for the train accident you were involved in, you need to contact attorney Chris Purcell to schedule a free legal consultation. For more than two decades, Chris Purcell has been fighting for the victims of negligence in southern California. He’s established a reputation for excellence with judges and colleagues, and he knows how to win. Chris was part of the legal team that won this state’s largest-ever civil judgment – a $150 million verdict in 2013 – for an innocent family victimized by negligence. Chris Purcell is well-known in the southern California legal community for his integrity, his tenacity, and his record of success. He has experience representing clients in cases involving train accidents, motorcycle accidents, bus accidents, pedestrian accidents, truck accidents, bicycle accidents, premises liability, dog bites, slip and fall accidents, spinal cord injuries and burn injuries. If you’ve been injured in a rail accident or a derailment in southern California, get the trustworthy legal representation you need. Chris Purcell represents clients on a contingency fee basis, so an injury victim pays no fees unless and until Purcell Law recovers compensation on your behalf. To schedule a free first consultation with Riverside train accident attorney Chris Purcell, call 714-332-5098, or contact Purcell Law by email after any injury caused by negligence in southern California.